Hi everyone! I was missing in action these past few days, too busy to even sit down and try to get some posts together. But I'm back today with the perfect summer project: the water bottle holder! For several years now we have banned plastic water bottles in our house. The kids have reusable bottles to take to school, and my husband and I have our own reusable bottles too. Carrying four full water bottles in a bag, however, is complicated, but it's exactly what we ended up doing whenever we are out together. Until now. The water bottle holder is a mini bag that fits just one bottle and that anyone, especially the kids, can easily carry out while on a stroll, running, riding a bicycle, going to the beach or anywhere else summertime may take us. I didn't make a pattern, because every reusable water bottle we have at our house comes in a different size, but I'm going to show you how to make a water bottle fitting whatever reusable or disposable water bottles you use! First, you need cute fabric. This one was for my son and I used a Robert Kaufman fat quarter that I've had in my stash for years, waiting for the perfect project. You'll need to cut two rectangles of fabric wide enough to go around the bottle (with seam allowances to spare) and tall enough to cover the bottle plus an extra 3 to 5 centimeters. Then place the bottle over the rest of the fabric and mark a circle around it. Repeat for a second circle. Cut around the circles leaving a wide margin. If you are used to sew with a 1/4 seam allowance, use 1/2, if you're used to a wider seam allowance, increase accordingly (otherwise the water bottle holder will be too tight and it will be hard to get the bottle in and out). Leave it for the time being, and let's focus on making the strap. Decide how long and how wide you want the strap to be and cut a strip of fabric accordingly (adding seam allowances). Now you have two choices: sew the fabric right sides together, turn inside out and press flat (prettier finish but hard to turn inside out) or fold the fabric as if it were bias tape, press, fold in half again and top stitch (not so prettier finish since the stitches will be visible, but much easier and faster). Now tuck the tips of the strap in between the two layers of fabric and pin in place. Top stitch all around. You're done! One water bottle holder ready for summer! If you want to add a finishing touch (totally optional), sew a folded piece of elastic (or ribbon) over the back seam of the bottle holder and use it to tie around the top of the bottle. It's totally optional, but helps to keep the bottles in place, especially if you're using it for sports. 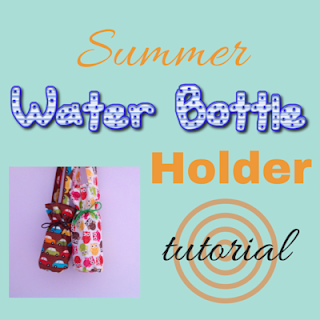 It's time to get ready for summer, so go and make your own water bottle holder now! What a cute project! I have been so tempted to sew again. I just need to find time for it first. Thank you so much for joining the #tiptuesday link party. Thank you for stopping by Debbie. This is a very quick project, so it's ideal if you want to start sewing again! It's ideal for summer! Thank you Sue! You made such nice water bottle holders! Thanks for sharing at the Cooking & Crafting with J&J party! These are awesome. Such a geeat idea. I need to make one of these for my friend. Thank you Michelle, let me know how it goes! These are adorable! I love the fun fabric prints you chose, too! I am co-hosting the Fiber Tuesdays Link Party, and I would like to invite you to stop by and share this link! Done! Thank you so much for the invitation! Those are too cute! I bet it's a great way to keep your kids hydrated. This was a great addition to the #AnythingGoes Link Party. See you next week. Very clever Water Bottle Holder, the kids will love it. Thank you for sharing with the Clever Chicks Blog Hop! I hope you’ll join us again next week! Thank you Kathy, have a great weekend! I have come across this problem, where sometimes it is just a pain in the tush to haul your bottle around with you. Thanks for posting. Hello from Thank Goodness It's Monday. I'm making one for myself too, that's for sure! Thank you for stopping by and have a great weekend! Hi Teresa, I'm stopping by again to thank you for joining #WednesdaysWisdom. Thank you for the opportunity to share! Have a wonderful weekend! I need some of these! I wish I had a sewing machine! I think I could make one. You can always hand sew, but it will take you a bit longer...anyway, thank you for visiting, have a great week! What a great idea! I love this and wish I could sew! Thanks for stopping by the Say G'day Party and sharing! Pinned and look forward to seeing you next Saturday!! These are SO cute! What a great idea! Thanks so much for taking the time to link up with us over at the #HomeMattersParty - we hope to see you again this Friday! Thank you Kristen, linked up to this week's party already! Wow! This is such an adorable water bottle holder. With the lining and handle, it seems like it needs a fancier name :) lol You are much too clever for me :) What talent! Super cute!! Thanks for sharing on My 2 Favorite Things on Thursday!! Hope you come back tomorrow!! Pinned!! I love your creativity and thank you for sharing with us this week at Celebrate Your Story, and I hope your week is going great. Thank you Sandra, for hosting and for stopping by! Let's help kids stay hydrated with a bright and bold water bottle holder that they can carry on their own. A great option for field trips & summer activities!